For upcoming film Knocked Up, a story about a one-night-stand pregnancy and the unlikely couple that decides to go it together, ad firm ADD has built the Knocked Up Babymaker. 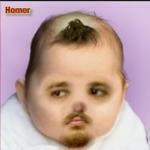 The site enables users to upload images of two "parents" and combine their features to make a baby. Afterward you can send this hypothetical disaster to friends, family or the mashed-up victims of your unbridled imagination. The baby at left is the happy result of a zealous PR guy mashing up the two male co-stars of the film. This is one more reason why you should never exchange numbers after converting on a one-night stand. It's a sad day when you need to hire an agency to rip off Conan O'Brien's "If They Mated".